Yesterday the official Deus Ex Facebook page announced that Eidos Montreal would give the world its “first look” at Deus Ex: Human Defiance — a name that Square Enix cleverly trademarked last February. If the April 1st debut wasn’t enough of a hint, Eidos released a video today revealing that the entire Defiance setup is nothing more than an elaborate (and humorous) April Fools joke. As shown in the April Fools video reveal, Deus Ex: Human Defiance is a prequel to Deus Ex: Human Revolution which tells the story of the first adventure of Adam Jensen. Eidos Montreal explains that because Defiance takes place in the past, it gave the team the idea to make the entire project an old school 8-bit drop-in co-op game. I’m not much for April Fools jokes, however, I’ll make an exception for this one. Eidos Montreal went above and beyond with Deus Ex: Human Defiance by trademarking the name and making everyone believe it was either a new game or the title of an upcoming movie. Plus the actual 8-bit gameplay and video presentation is pretty entertaining to watch. Truth be told, the fake gameplay of Deus Ex: Human Defiance actually doesn’t look half bad. 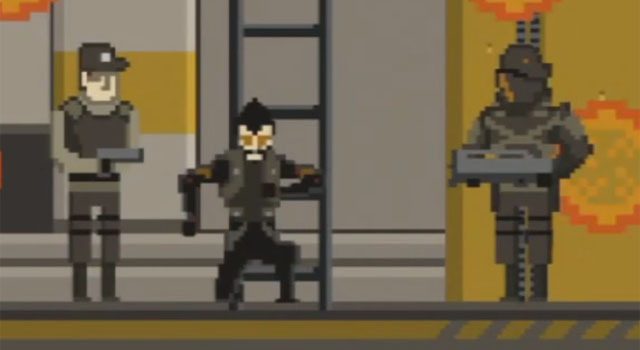 I’d be willing to bet that there are more than a few gamers out there who wouldn’t mind getting an 8-bit Deus Ex as a side project.